Request The Blue Mountain Band on radio! "I am playing a cut on this Sunday's show. Nice work!" BILL KNOWLTON, "Bluegrass Ramble," Sundays: 9 pm to midnight (EST) over WCNY-FM (91.3) Syracuse, WUNY (89.5) Utica, WJNY (90.9) Watertown NY, also: www.wcny.org udmacon1@hotmail.com Since 1973! I forgot to mention in an earlier CD that...I'm slow in returning e-mail. I do apologize for my tardiness. I've been listening to the great sample CD from you and The Blue Mountain Band and will definitely give air-play. Right off the bat, Missing You caught my ear. I can close my eyes and feel as if I was the one traveling down Hwy. 95. Vocals are clear, instrumentation compliments the lyrics. Simply put, overall composition is great. I'll have to say this song is my favorite. It will fit in perfectly during my early morning program. I also enjoy a similar feeling from Long Road Home, Walk With You, Roadside Attraction, and Pretty As A Flower. Temperance Reel is a fine tuned instrumental that I'll use as my featured 7:00am instrumental (at a future date). But again, I'm a little slow. As for this Wednesday - 2/24/2010, I'm devoting most of the program to my idol, Dr. Ralph Stanley. I just returned from one of his birthday celebrations in Kingsport, TN., and must say that Dr. Ralph looks great at 83. Thank you so very much for sending the CD to us here at WDVR. Check us out on the web when you can. We are a diversified, independent radio station celebrating 20 years in broadcasting. I'll also encourage my fellow DJs to air your songs as well. Loved every track. Thanks for sending it. Great musicianship, wonderful harmonies. I played "Roadside Attraction" on my FolkTime! program this morning and will be airing other tracks over the next several weeks. My compliments to you and Blue Mountain Band members. 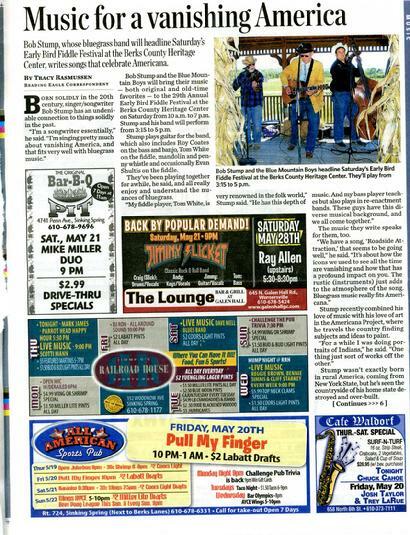 Here is a blurb from The Reading Eagle in Reading PA . We were headliners at this wonderful event. This was the Berks County 29th annual Fiddle Festival and we were proud to be a part of it. Special guest Jerry Oland joined us on 5 String Banjo.